(Hong Kong, 23 November 2017) Vitargent (International) Biotechnology Limited (“Vitargent”) published test results of 68 popular liquid milk and milk beverage products under 29 brands available in the market on its Test-it™ information platform (www.fishqc.com). Known for its recent six safety examinations of cooking oil, BB cream, instant coffee, sunscreen, ice cream and lip balm, Vitargent has applied the “transgenic medaka” and “zebrafish” embryo toxicity testing technology, which is unique in the world and developed by Hong Kong scientists. The safety test rated 46 samples as Green Fish (excellent), 10 samples as Yellow Fish (basic) and 12 samples as Red Fish (sub-optimal). Nearly 30% of the samples were milk beverages (i.e. containing food additives or are solids derived from milk), some of which were added 13 types of additives. The overall safety of milk beverage samples was lower than liquid milk samples by over 50%. Vitargent noted that many consumers are not aware that the common “fresh milk” can be divided into two groups: liquid milk and milk beverages. Consumers are recommended to read information about product origins and ingredients on the labels before purchasing, and choose products that are safe to buy and those that have passed the “Green Fish” triple test. Milk is an important part of a balanced diet. However, people usually focus on product origins, fat content (whole-fat, low-fat, skimmed) and flavour instead of the types of milk. According to the guidelines on milk classification of the Centre for Food Safety of Hong Kong, milk can be grouped into three categories: milk (means cows milk and includes cream and separated milk but does not include dried milk, condensed milk or reconstituted milk or buffaloes milk or goats milk); milk beverage (means any beverage resulting from the combining with a liquid of milk fat and other solids derived from milk, whether exclusive of any food additive or otherwise); reconstituted milk (means products resulting from the recombining with water of milk constituents, namely, milk fat and other solids derived from milk exclusive of any other substance). Reconstituted milk is not common in Hong Kong as milk and milk beverages are currently the mainstream. Based on whether they contained additives, samples were categorised into two groups in the test: milk drink (where milk is the only ingredient) and milk beverage (which contain ingredients other than milk, including modified milk and reconstituted milk). 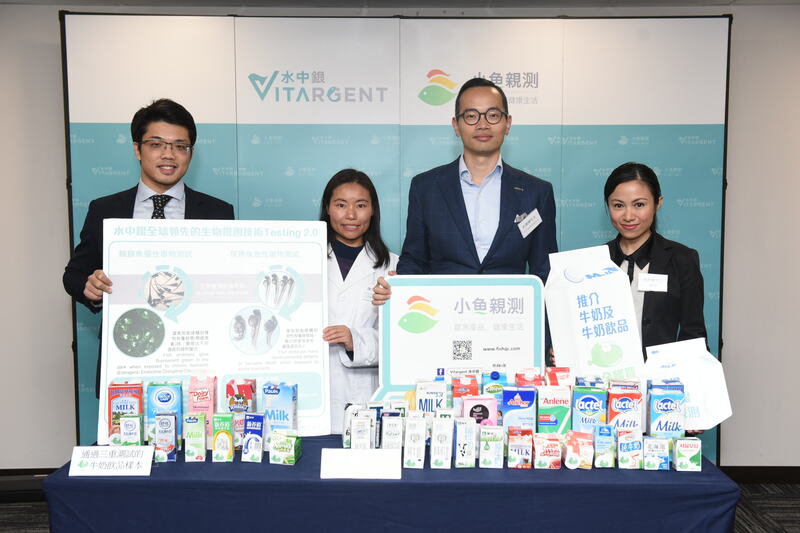 Vitargent purchased 68 milk drink and milk beverages under 29 brands from supermarkets in Hong Kong (ParknShop, fusion by ParknShop, Wellcome, City’Super) and online platforms (JD.com, Tmall.com) in the past year for fish embryo toxicity tests. Local and international brands were included, such as the Kowloon Dairy, Nestlé, Anlene, Anchor, Pauls, Harvey Fresh, Mengniu Dairy etc. Red Fish means “Sub-Optimal” in terms of safety, indicating a product is below standard in one or more criteria in the screening of acute toxicity, chronic toxicity and banned ingredients. Consumers are recommended to purchase with extra caution. Among the 68 samples, Test-it™ rated 46 samples as Green Fish (Excellent), ten samples as Yellow Fish (Basic) and 12 samples as Red Fish (Sub-optimal). In terms of price, the average price of the 68 samples purchased was 2.6HKD/100 mL. The most expensive one costed 10HKD/100mL, which was nearly nine times of the cheapest one which costed 1.1HKD/100mL. Among the 22 samples costed more than 2.6HKD/100 mL, 17 samples (77%) were rated Green Fish, three (14%) were rated Yellow Fish and two (9%) were rated Red Fish. Among the 21 samples that costed between 2HKD/100mL and 2.6HKD/100mL, 14 samples (68%) were rated Green Fish, two (9%) were rated Yellow Fish and five (23%) were rated Red Fish. Among the 25 samples that costed less than 2HKD/100mL, 14 (56%) samples were rated Green Fish, five (20%) were rated Yellow Fish and six (24%) were rated Red Fish. In conclusion, the safety of the high-priced samples was relatively higher than mid-priced and low-priced samples, with nearly 80% samples rated as Green Fish. In terms of brand origins, samples under the test were from Asia (Hong Kong, China, Korea, Japan, Indonesia), Europe (France, Germany, the Netherlands, Switzerland), America and Oceania (New Zealand, Australia). Among the 46 samples of Asian brands, 29 (63%) of them were rated Green Fish, nine (20%) were rated Yellow Fish and eight (17%) were rated Red Fish. Among the ten samples of European and American brands, eight (80%) were rated Green Fish while two (20%) were rated Red Fish. Among the 12 samples of Oceanian brands, nine (75%) were rated Green Fish, one (8%) was rated Yellow Fish and two (17%) were rated Red Fish. As to the place of production, milk produced in Asia (Hong Kong, China, Korea, Japan, Indonesia, Vietnam), Europe (France, Germany, the Netherlands), America and Oceania (New Zealand, Australia) were tested. Among the 46 samples manufactured in Asia, 28 samples (60%) were rated Green Fish, nine (20%) were rated Yellow Fish and nine (20%) were rated Red Fish. For the nine samples produced in Europe and America, eight of them (89%) were rated Green Fish while one (11%) was rated Red Fish. Among the 13 samples manufactured in Oceania, ten samples (77%) were rated Green Fish, one (8%) was rated Yellow Fish and two (15%) were rated Red Fish. In conclusion, in terms of both brand and product origins, Europe and America achieved a better result than Asia and Oceania in general, with 80% of samples rated as Green Fish. Besides, the overall safety for skim milk samples achieve a better result than whole milk and low-fat milk. Among the 46 samples of whole milk brands, 28 samples (60%) were rated Green Fish, nine (20%) were rated Yellow Fish and nine (20%) were rated Red Fish. Among the 14 samples of low-fat milk, 11 samples (79%) were rated Green Fish, one (7%) was rated Yellow Fish and two (14%) were rated Red Fish. For the 8 skim milk brands, seven (88%) were rated Green Fish and one (13%) was rated Red Fish. Moreover, the test also found Vitamin A supplement in five samples, Vitamin D supplement in eight samples and Vitamin E supplement in four samples. Dr. Xueping Chen said, “According to the WHO and regulations of different countries, taking supplements properly may not harm human body. However, Hong Kong people have developed the long-term habit of taking nutrition supplements and thus, they may exceed the suggested daily intake when considering the dietary nutrition. For example, Vitamin A is an antioxidant with preservative property. However, it is proved in medical studies that excessive intake may affect fat metabolism, leading to increase of toxicity in liver, low bone density and bone fracture in middle-aged and elderly women, and even birth defects. In 2012, the Ministry of Health of Norway warned that pregnant women and nursing mothers should avoid products containing Vitamin A.” Dr. Xueping Chen pointed out that several toxicology research reports on milk published in recent years proved the risks of other toxics in milk, including known microbial contamination, mycotoxin (such as Aflatoxin) contamination, veterinary drugs residues,, pesticide residues, and other unknown contamination (such as melamine). Annie Lee pointed out that many parents hesitated on what age to give milk to their babies and what types of milk should be given. In fact, infants aged below twelve months should not be fed milk in replacement of breast feeding or infant formula because this hinders the intake of protein, sodium and potassium etc, and affects their growth and development. If the baby is allergic to milk protein, it may develop allergic reaction, including skin swelling, eczema, diarrhoea, vomiting, hematochezia or even asthma. Kids aged between 1 and 2 may have semi-solid food and whole milk which give extra energy and fat for their growth and their needs for body and brain development. Nevertheless, if young children have been fed with breast milk, it may take time for them to get used to cold fresh milk. Parents may take it step by step and feed them with sweet formula milk powder or cheese. Children aged 2 or above can drink high-calcium low-fat milk while children aged 5 or above with balanced development can drink skimmed milk. For adult and the elderly, low-fat dairy products are recommended. They should also increase intake of calcium based on their needs. Annie Lee reminded that milk may not be suitable for all as everyone has different body conditions. People with a sensitive digestive system, milk allergy and lactose intolerance should avoid drinking milk. Lactose-free milk, soy milk, almond milk or rice milk are available for those with lactose intolerance. Furthermore, medicine should not be taken with milk because this will affect medical effect. Consumers should pay attention to the date of manufacture, expiry date and sterilization descriptions on labels when choosing fresh milk. In general, the shelf life of UHT Processed products is longer than that of pasteurized products. For coffee brewing, UHT processed dairy products are recommended as they can maintain more nutrition in high temperature. For detailed product list of Green Fish which passed the acute toxicants, chronic toxicants tests and ingredients check, please visit the online consumer product safety information platform Test-it™ at www.fishqc.com for a wise choice. CODEX STAN 192-1995. General Standard for Food Additives. Regulation (EC) No 1333/2008 of the European Parliament and of the Council of 16 December 2008 on food additives. Official Journal of the European Union. L 354/16. 31.12.2008. Commission Regulation (EU) No 1130/2011 of 11 November 2011. amending Annex III to Regulation (EC) No 1333/2008 of the European Parliament and of the Council on food additives by establishing a Union list of food additives approved for use in food additives, food enzymes, food flavourings and nutrients. Official Journal of the European Union. L 295/178. 12.11.2011. Commission Regulation (EU) No 1129/2011 of 11 November 2011, amending Annex II to Regulation (EC) No 1333/2008 of the European Parliament and of the Council by establishing a Union list of food additives. Official Journal of the European Union. L 295/1. 12.11.2011. USFDA Food additive status list, Color Additives in Food, and Everything added to food in the United States (EAFUS). Standards for use, according to use categories. Effective from September 26, 2016. Norwegian SCFS, Risk Profile: Retinaldehyde. Norwegian Scientific Committee for Food Safety (Vitenskapskomiteen for Mattrygghet), 2012. Jawaid S et al. Contamination profile of aflatoxin M1 residues in milk supply chain of Sindh, Parkistan. Toxicology Report. 2015, 2: 141801422.
. Rama A et al. Assessment of antibacterial drug residues in milk for consumption in Kosovo. Journal of Food and Drug Analysis. 2017. 25: 525-532. Han RW et al. Survey of veterinary drug residues in raw milk in Hebei Province, China. Journal of Food Protection. 2017. 1890-1896. Chen X et al. Method for the quantification of current use and persistent pesticides in cow milk, human milk and baby formula using gas chromatography tandem mass spectrometry. Journal of Chromatography, Part B, Analytical Technology and Biomedical Life Science. 2014, 970: 121-130. Hassani S et al. Occurrence of melamine contamination in powder and liquid milk in market of Iran. Food Additives & Contaminants: Par A, 2013. 30: 413-420.